If you want a more seasonal addition to your yard, you've got options. There are fire bowls that come in a variety of materials: copper or stainless steel bowls are usually lighter, but heavier cast iron bowls also do a nice job of radiating heat. Fire tables are similar to bowls, but are often made at coffee table height. There are also chimney-style options (freestanding pieces with a chimney-style vent) that come in a range of materials. If you're looking to create a more permanent fire pit, you have just as many options. If you're a DIY enthusiast, head to your local hardware store and purchase a pre-made kit that comes with everything you need; or go fully custom, with a landscape professional or contractor doing the design and building it. 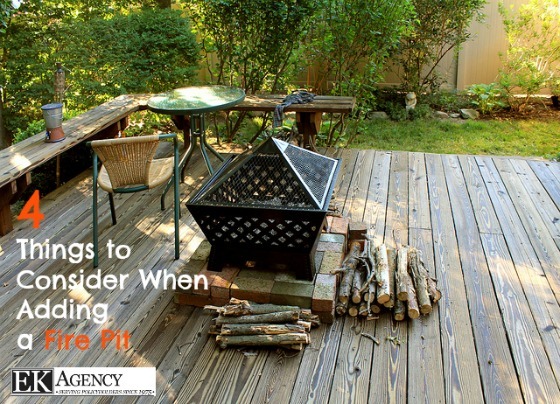 While there are alternate fuel types for fire pits, wood or gas are the most common choices. Those who favor a true "outdoor" smell usually prefer burning real logs, but that's higher maintenance. requiring constant attention, lots of firewood and using a screen. Alternatively, go the postmodern route with gas or propane for an instant fire. You can even install a remote switch. The downside is that this is more expensive, and doesn't give you the same warmth or effect as the real deal. Because you're dealing with fire (or gas), there are often restrictions and rules on where you can set up shop. Many places require a minimum of a 10-foot distance from your house and neighbors’ yards. Some don’t require a permit if the fire pit fits within set size requirements; others require a site inspection from local fire officials to make sure your proposed location is safe! Check with your local officials before you do anything. Fire pits can be a fun addition to your home! Just make sure to install them safely -- and contact your insurance agent with any questions! Sources: Allstate, Considering a Backyard Fire Pit | HGTV, Outdoor Fire Pits and Safety.